Islamabad: Pakistani President Asif Ali Zardari was undergoing what his office said on Wednesday were routine medical tests in a Dubai hospital, but which fuelled rumours of his possible resignation. 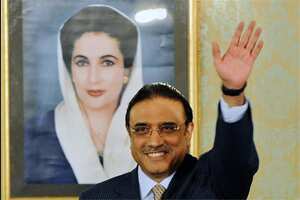 Zardari’s office said a news web report, which kicked off much of the speculation, was untrue. Financial markets were unaffected by the rumours. “President Asif Ali Zardari is in a Dubai hospital for medical tests and checkup as planned," presidential spokesman Farhatullah Babar told Reuters. “Reports in some sections of the media speculating on the president’s activities and engagements are speculative, imaginary and untrue." A Pakistani source in Dubai familiar with the president’s condition told Reuters that Zardari had had a minor heart attack six years ago. “Since then, he has been on medication," the source said. “Two days ago, he had chest pain" and decided to go to Dubai for checks. Twitter and other social media were awash in contradictory information. In a span of 20 minutes, micro-bloggers had placed Zardari in Dubai, Abu Dhabi and Saudi Arabia. Some speculated the president would travel to Britain, or return to Pakistan by the end of the week. Others suggested the president had suffered another minor heart attack and may resign. “Some elements blew up this to create unrest in the country," said Fauzia Wahab, a senior member of Zardari’s Pakistan People’s Party. “His visit to Dubai and having medical check up is perfectly normal." Tensions between Pakistan’s civilian government and military have bedevilled the nuclear-armed South Asian country for almost its entire existence, with the military ruling the country for more than half of its 64-year history after a series of coups. First there was the jailing of a CIA contractor for shooting dead two Pakistanis in the city of Lahore. Then there was the secret US commando raid inside Pakistan that killed al Qaeda leader Osama bin Laden, and then came US accusations that Pakistan was involved in attacks on American targets in Afghanistan. It was also further rocked by a 26 November Nato strike on two Pakistani border posts that killed 24 soldiers, infuriating the country’s powerful military which also has a tense relationship with Zardari.